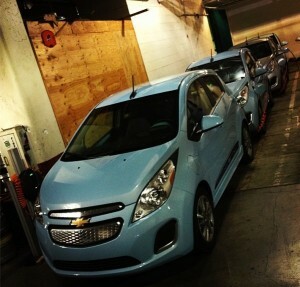 I had the opportunity to drive the 2014 Chevy Spark EV last month at a media event in Portland, Oregon. The drive route ran through the streets of the city, onto the highway, and out into the suburbs. This provided the Spark EV with an ideal setting for its virtues to shine. It can be a trick to shoot media events like this. 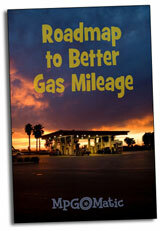 The schedule is extremely compressed and time behind the wheel is often limited. We set out from the garage of the Portland Kimpton hotel and headed to Electric Avenue. I hustled to get location shots and hung a pair of cameras on the car on our departure from the parking garage (although I only ended up using the external camera). Lets go out on a limb and call the Spark EV the first affordable electric hot hatch. Who could argue with 400 foot pounds of torque and a 0-60 MPH time of 7.5 seconds? With that much power, the engineers are clearly holding back its full potential, lest the front tires disintegrate into billows of smoke and shards of rubber. I drove from Electric Avenue to the lunch location, out in the burbs. Although my time behind the wheel was short, the Spark EV proved itself to be a superb city car, fully capable of freeway travel, and fun to drive over a twisty route. The added weight of the batteries provides a considerable improvement in ride over the gasoline-powered Spark. If I owned a Tesla Model S, I wouldn’t be keen on parking it on a New York City Street, much less shoehorning it into a tight parking spot. The Spark EV, on the other hand, was engineered to be stuffed into the tiniest of spaces. Its outward appearance is utilitarian, not excessive. The Spark EV is a car for the masses, not a toy of the 1%. With a price just under $20K after the Federal Tax Credit, the Spark EV provides 5x the versatility of a Tesla Model S at 1/5th the price. If the EV revolution is to be successful – and if we expect to see any real dent in carbon emissions in the near term – there must be at least 50x more electric city cars sold than expensive electric luxury sedans. ASAP. This is exciting news. The common thread among most comments on car blogs about EV cars is their perceived lack of pep, range and their price point. There’s no telling how long the tax subsidies will remain, but it is hard to deny the appeal of this vehicle. The most common objections I have heard to purchasing an EV are seemingly addressed now. It will be interesting to see how this vehicle advances EV market penetration and demand.